The Kaiser Permanente Community Fund (KPCF) at Northwest Health Foundation was founded in 2004 with an initial $28 million investment by Kaiser Permanente to improve conditions for health. As we learned how to best partner with community organizations, we made pivotal decisions that changed how we operated. In this story, we tell how Salem/Keizer Coalition for Equality taught us to put new insights into action. A mother and son practice reading together at SKCE’s Leyendo Avanzamos program. Before Estela Flores joined the programs offered by the Salem/Keizer Coalition for Equality (SKCE), she did not understand the grading system at her children’s school. Estela did not graduate elementary school and moved to the United States with the hope of a better future for her children. However, she did not know how to navigate the bureaucracy of the school district, she couldn’t help her children with the homework they were assigned, and she was not familiar with the meaning of an “A,” “B,” or other grades the teacher gave. SKCE’s motto is backed by solid research: parents are the key to their child’s educational success. For years, SKCE has worked to inspire and equip Latino parents to get involved in their children’s education and schools and change the dynamics that influence academic success for students of color. When SKCE first connected with KPCF, SKCE wanted to address Latino student education success through parent program support and increased advocacy. They worked to activate more Spanish-speaking parents to get involved in their children’s education, focusing on absenteeism and mental health. At the same time, SKCE also knew that direct intervention with parents was not enough; they needed to advocate more and work to change school district policies and practices by partnering with districts. We saw an opportunity to invest in SKCE in a way that brought together many of the lessons we learned throughout the life of our fund. Instead of funding a specific program, we provided SKCE with flexible funding, coaching, and technical assistance that allowed the organization’s leaders to hire administrative staff and step back from day-to-day operations. By doing so, they could focus on building capacity to deepen relationships, develop partnerships, and create the community-led infrastructure for systems change advocacy. SKCE increased the size and resources of their advocacy program budget to campaign for a more equitable and culturally responsive education workforce. 38% of the district’s students are Latino, but only 6% of their teachers are, and SKCE knew students would benefit from seeing themselves reflected in their educators. It is well-documented that when students see their race, ethnicity, and culture reflected in their schools, their educational success, health, and attendance significantly improve. In addition to funding staff time for advocacy activities, committee participation and professional development, KPCF provided critical technical assistance to conduct a community assessment, clarify strategies, and use developmental evaluation to track community change. Building strong relationships with district administrators and leaders was a key component and took lots of time. SKCE was able to hire more people and parents from the local Latino community and develop their leadership. With their new capacity, they had the ability to attend the school district’s decision-making committees, testify more at school board meetings, and meet consistently with district leaders. Together with district leaders, they identified specific changes the Salem Keizer School District needed to make in their recruiting, hiring, and training practices. With SKCE’s expert Latino parent voices, the district adopted their first Safe and Welcoming School Resolution, created a new office of Equity and Student Advancement, and promoted a long-time principal of color to direct it. The new office began the work of training principals and teachers in cultural awareness and responsiveness, and developing long-term plans for continual professional development in these areas. Latino students and parents began feeling more welcome and safe at school. With flexible funding, SKCE was also able to hire Spanish-speaking parents to plan a systems change strategy with their constituents. They focused on partnership development and continuously showed up to district meetings as they grew into a trusted partner of the district. The highlight came in the summer of 2017 when the district awarded SKCE a contract to conduct a teacher training institute in collaboration with the district’s human resources department. Hosted at SKCE’s office, 17 educators attended the pilot Language and Culture Institute, learning Spanish in the morning (taught by the district) and spending the afternoon doing activities with Latino parents and staff. SKCE staff also worked with the district to host job fairs where they hired Latino employees. The relationship between the district and parents of SKCE has grown strong, in part due to the openness of Superintendent Christy Perry and the people she hired. Last year, SKCE was recognized as the district’s partner of the month at the school board meeting. “I feel like we have finally reached our goals of being a partner to the district, of being truly valued as a Latino organization. This literally happened because KPCF,” said Annalivia. KPCF is proud of our flexibility in keeping up with the latest research and trends, not just in health but in the nonprofit sector, in education and in and equity issues in general. We found that our culturally specific nonprofit partners were more than ready to take their work to a higher level of systems change as soon as we stepped up to help them make that possible, and other foundations are following suite. Culturally specific organizations are often led by people who are affected by the social justice issues KPCF wants to fund. We are investing in these organizations as the most effective way to improve health and education equity in our society. A story with Healthy Beginnings+Healthy Communities Collaborative Healthy CAPACES. Graduates from People’s Representatives’ elected office cohort stand and smile in front of a large painting depicting farmworkers. Representation matters. When elected officials and other community leaders reflect the communities they serve, those communities do better. Having had similar experiences to their constituents, these leaders understand the issues firsthand, know the barriers they need to tear down, and can create change that improves people’s lives. In reality, leaders rarely reflect the communities they serve. Although only 31% of the U.S. population is made up of white men, white men make up 65% of the United States’ elected officials. Similarly, 38% of Oregonians are white men, but white men make up 67% of Oregon’s elected officials. That means women and people of color, among other populations, are underrepresented. Four out of five students in Oregon’s Woodburn School District are Latinx, but it wasn’t until 2017 that the Woodburn school board had a majority of Latinx school board members (although still not four out of five). As Latinx representation on Woodburn’s school board has grown, Latinx student dropout rates have gone down, teen pregnancy rates have gone down, gang activity has decreased, and graduation rates have gone up. One of Woodburn’s high schools is now among the top five in the nation. Woodburn’s success in electing Latinx candidates is largely due to the efforts of a group of nonprofit organizations known as Alianza Poder/Power Alliance (Formerly the CAPACES Network). The Alliance includes an electoral organizing entity, a housing development corporation, a nonprofit focused on educational accountability and equity, a statewide immigrant rights coalition, a youth leadership program and more. By leveraging all their skills, resources and, most importantly, people power, Alianza Poder does an amazing job of engaging and activating their communities, getting out the vote, and preparing community members for leadership opportunities. Acción Política PCUNista, the Alliance’s 501(c)4, succeeded in electing Oregon’s first Latina immigrant to the Oregon House of Representatives in 2016. They also supported Latinx candidates to run for school board and other local positions. While Alianza Poder has led incredible progress, Oregon’s elected officials are still far from reflecting Oregon’s Latinx population (Oregon’s largest ethnic minority). So, this year CAPACES Leadership Institute launched People’s Representatives – a bilingual leadership development institute based in Marion and Polk Counties, designed to prepare social-justice-minded Latinxs to compete for appointed or elected office or volunteer on committees. People’s Representatives has two tracks: one for people curious about running for elected office, and one for people who want to serve on committees. Over the course of five trainings, all participants self-assess their values, financial resources, social network, etc. ; conduct research about their region and elected office/committee of choice; and learn about messaging. Elected-track participants also learn about fundraising for and planning a campaign, while committee-track participants learn about building relationships and making change through committees. Graduates from People’s Representatives’ committee cohort stand, sit and kneel in front of a wall hung with paintings and photos. They’re all smiling. The committee pathway graduated its first cohort of 16 people, mostly Latinx parents, on April 28, 2018. The first elected pathway cohort graduated on September 15, made up mostly of young adults. Already, some of the committee pathway graduates have been selected to serve on a school district hiring committee and a Salem area transportation committee. People’s Representatives will continue to check in with all its graduates, even after they’ve taken on public service leadership roles. We can’t wait to hear more stories from People’s Representative graduates and the cohorts to come! A story with Healthy Beginnings+Healthy Communities Collaborative Eastern Oregon Latino Alliance for Children and Families. A dancer in a Jalisco dress and Sugar Skull mask performs at EUVALCREE's Day of the Dead celebration. Communities need places and reasons to gather, to build relationships, celebrate together and support one another. When neighbors know each other and spend time together, neighborhoods are safer and stronger. Strong community connections are even more important in rural communities, where resources are scarcer and services are farther away. In eastern Oregon, the nonprofit EUVALCREE (a 501(c)3 organization) arose with the purpose of connecting Malheur County’s Latino residents with each other and with other eastern Oregon communities and institutions. They wanted to see more Latinos taking on leadership roles and influencing policies. By engaging and connecting community, and training and positioning leaders, they believe they can improve the lives of children, families and communities throughout Oregon and Idaho. One way EUVALCREE seeks to accomplish these goals is by hosting large public events, bringing people together to relax and enjoy themselves. This strategy has had huge success. For one, it creates safe cultural environments, through which the Latino community in Malheur County has shared their culture with non-Latino community members and overcome negative stereotypes. It’s also resulted in many more community members expressing interest and becoming involved in EUVALCREE’s leadership trainings and other programs. Youth stand and smile beside a food cart at EUVALCREE's Day of the Dead celebration. EUVALCREE’s events attract thousands of community members a year. Their largest event so far, on Children’s Day 2018, drew over 3000 people. Not to mention, 94 volunteers committed 754 hours of their time to make it happen. When EUVALCREE was founded in 2014, the infrastructure to support these events didn’t exist. So, EUVALCREE created the infrastructure. They gathered the people and learned the skills to provide sound systems, lighting, security, etc. Before long, other groups were asking for their help with non-EUVALCREE events. As demand for their services grew, EUVALCREE’s leadership decided to form an LLC – an event production company – to meet the community’s needs and protect their nonprofit from liabilities. They also registered a second LLC – a security company – owned by the production company. All proceeds go to their 501(c)4 (EUVALCREE ACTIO), which owns the first LLC. Members of the Eastern Oregon Latino Alliance for Children and Families pose in front of the Oregon State Capitol building. EUVALCREE ACTIO was founded in 2018 to support and provide community members with additional tools and resources for civic engagement and community efforts. Altogether, EUVALCREE, EUVALCREE ACTIO and the two LLCs are operated by and with 76 people and engage hundreds of volunteers and thousands of community members. They continue to expand their work. In September of 2018, EUVALCREE will be opening an office in Hermiston. Their region has expanded to include 8 counties in Oregon and 5 in Idaho, and they hope to host events and support community in all these places. If you’re ever in eastern Oregon, make sure to check out one of EUVALCREE’s events. If you’re interested in hosting an event in eastern Oregon, use their services! You’ll be supporting community and leadership development among Latino Oregonians. A story with Healthy Beginnings+Healthy Communities Collaborative La Voz de la Comunidad. BYP100. Dreamers. The students from Marjory Stoneman Douglas High School in Parkland, Florida. Youth are leaders. And, they will continue to lead as they grow older. We need to prepare them for future leadership roles, from committees and boards to elected office and everything in between. Oregon and Southwest Washington become more and more racially and ethnically diverse every day. Unfortunately, there are few culturally-specific youth leadership programs, particularly beyond the I-5 corridor. Youth of color don’t see themselves represented at most leadership programs, and, often, they opt out. A decade ago, Cispus Learning Center staff member Vincent Perez noticed few Latinxs participated in youth leadership programs in Washington. So, he convinced the Association of Washington School Principals to develop a leadership camp specifically for Latinx youth. That camp was La Cima, a bilingual leadership camp for Latinx youth with the goal of building their skills and improving school climates. Last year, noticing a similar need in their region, Lower Columbia Hispanic Council started La Cima Lower Columbia on Oregon’s North Coast. La Cima Lower Columbia welcomes Latinx high school students from Astoria High School, Seaside High School, Warrenton High School, Tillamook High School and Taft High School in Lincoln City. In 2017, 19 students spent three days together at Camp Kiwanilong. This April, 36 students spent four days together. Both years, participants wished the camp went on longer. At La Cima, everything is in English AND Spanish, and no one has to be proficient in both – campers or staff. Campers engage in hands-on activities, reflecting on experiences and issues, making goals for themselves, creating fun group presentations and solving problems together. This year, youth spent the last day of camp learning how to start clubs at their schools. That way, they’ll still have a little bit of La Cima with them throughout the year. So far, Astoria High School and Warrenton High School have both received funding for this purpose. As the lead organization for La Voz de la Comunidad, one of Healthy Beginnings+Healthy Communities’ ten Community Collaboratives, LCHC is involved in a project to learn about leadership development programs across Oregon and Southwest Washington and create a resource bank of leadership development curriculum. La Cima Leadership Camp is an asset to our region, and will certainly help inform that resource bank. In 2017 and 2018, Northwest Health Foundation convened the Disability Justice Leaders Collaborative – a group of fourteen disabled people of color interested in deepening their understanding of disability justice and discussing visions and strategies for ensuring the needs of people with disabilities are centered in decision-making. Arlene is one of the leaders participating in the Collaborative. A. Currently, I'm the cultural sustainability coordinator for Portland State University’s Student Sustainability Center and the community engagement coordinator for Green Lents. I also hold leadership positions through PSU’s accessibility committee, universal design subcommittee and environmental club. A. I’m not entirely sure what my future leadership roles will look like, but I'll be graduating from Portland State in Spring 2018, so they'll likely be significantly different. Right now I'm more focused on the process of shaping what principles I want to apply to my current and future work. A. I think it’s another opportunity to recognize the inherent value and dignity of everyone, which conflicts with the ways many of our systems and institutions currently operate. It’s also a chance to recognize the strength in our differences. Validating one another’s accessibility needs is crucial, and it requires that we are part of a community that holds itself accountable to a dynamic learning process. In these ways, disability justice feels like truly exciting and revolutionary work to me. A. I decided to apply for the DJLC, because I wanted to gain a better understanding of ableism, my own accessibility needs and how to apply these principles to my work. I wanted to do so as part of a community, and then work within that community to build collective power. Additionally, my identity as someone who's disabled doesn't exist separately from my identities as a queer, working-class Latina (from Salvadoran parents). In many spaces that focus on disability rights, we're not able to explore the significance and influence of our other identities and that comes at a huge cost. The DJLC is a unique and special space, because it really mobilizes those important conversations. Its leading principles should be part of all justice movements. Q. What is your favorite book, movie or song, and why? A. I have many favorites in each category, but the last book I read was Corazón by Yesika Salgado, the last movie I watched was Black Panther, and the last song I listened to was "Sound & Color" by Alabama Shakes. According to Western States Center’s Gender Justice Program Director Amy Casso, when you lead with Reproductive Justice you can win. Why? Because Reproductive Justice is intersectional and inclusive; everyone can see themselves in it. It also has the ability to shift narrative and culture in communities. 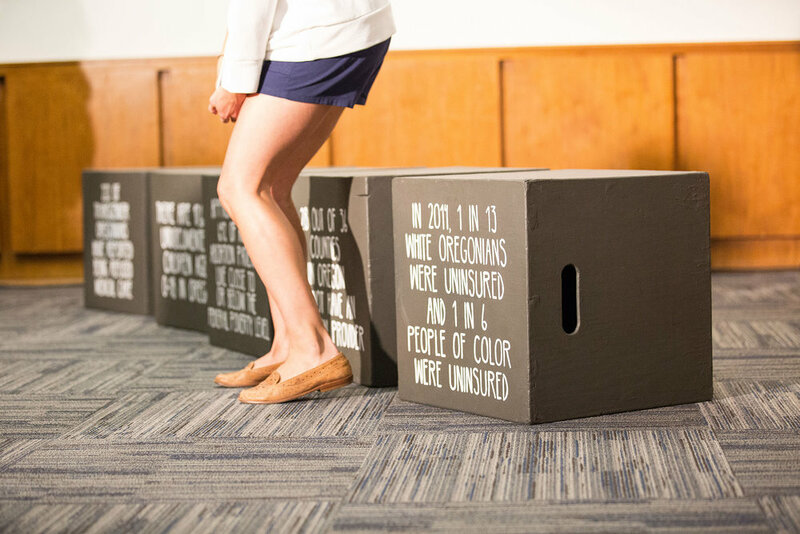 The CAPACES Network organizations, a group of primarily Latino-led and serving organizations in Oregon, saw an opportunity in Reproductive Justice. After participating in Western States Center’s We are BRAVE Cohort, CAPACES Network staff wanted to bring a Gender Justice and Reproductive Justice lens to all their work. They partnered with Western States Center to guide them through the process. Over the last year, CAPACES Network executive directors and staff participated in monthly trainings and discussions around building and integrating a Gender and Reproductive Justice lens into their organizations’ program work. A pivotal moment came in August when many of them participated in Activists Mobilizing for Power 2017 workshops like “Talking About Abortion in the Latinx Community” and “Over-policed and Undervalued: reproductive justice, prison-abolition and birthing” to deepen their understanding. CAPACES Network members also participated in the campaign to pass the Reproductive Health Equity Act, advocating for all Oregonians, regardless of income, citizenship status, gender identity or type of insurance, to have access to the full range of preventative reproductive health services. Over the next year, Western States Center and CAPACES Network will conduct a community assessment in order to better understand the community’s concerns and needs, as well as identify opportunities for policy shifts. They’re working closely with several organizations, including both of the Network’s youth organizations, Latinos Unidos Siempre (LUS) and Talento Universitario Regresando a Nuestros Orígenes (TURNO). It’s clear the partnership is already impacting community members. Western States Center recently hosted an event with Mujeres Luchadoras Progresistas, unrelated to their partnership with CAPACES Network. At the event, Amy Casso asked community members if they’d heard about the Reproductive Health Equity Act and what it could do for them. All of them had. Ultimately, CAPACES Network hopes this partnership will result in a healthier community and healthier families. Astoria celebrates Día de los Muertos with face painting and more. In America, all people have rights, no matter what they look like or where they come from. It’s not about where you were born; it’s how you live your life and what you do that defines you here in this country. Hardworking people, documented or not, make our communities stronger and deserve respect from all of us. Sadly, many immigrant Americans have faced disrespect and worse, including threats to their freedom and opportunity. Since President Trump signed an executive order expanding the number of immigrants considered fair game for detainment and deportation, immigrants throughout our region and the U.S. have become increasingly fearful of ICE raids tearing their families (and our communities) apart. An old cannery on Astoria's waterfront. However, rather than give up and give in to these destructive and unpatriotic federal policies, thousands of Americans have chosen to stand up and speak against them instead. In Astoria, Oregon, for instance, where Chinese and Latino immigrants have been the backbone of the canning industry for the last century, the Astoria City Council unanimously passed a resolution reaffirming the city’s policy of inclusivity. Like the City of Astoria itself, Astoria’s inclusivity resolution depended on the voices and actions of diverse community members to succeed. Originally, Astoria’s mayor and city councilors considered declaring Astoria a sanctuary city, but they changed their minds after the chief of police presented at a city council meeting. Members of La Voz de la Comunidad, an advisory group representing the Hispanic community living on Oregon’s north coast, attended that meeting and discussed the city’s decision. In the end, they agreed. While immigrants in Astoria deserved to know whether the city respected and supported them, La Voz thought about the negatives associated with the word “sanctuary” – loss of federal funding, confrontations with government officials – and realized the label “sanctuary city” could be detrimental. There might be a better option: an inclusivity resolution. Astoria’s city councilors and chief of police had already said they wouldn’t aid ICE. They’d said, if you haven’t broken any laws, you don’t have anything to fear from us. La Voz just wanted them to say it louder and make it official, so Astoria’s immigrants would know for sure the city stands behind them, and hopefully gain some peace of mind in the process. With help from Causa Oregon’s Executive Director Andrea Miller and a template developed by the Innovation Law Lab, Lower Columbia Hispanic Council’s Executive Director Jorge Gutierrez introduced the resolution and helped craft some of the language. La Voz de la Comunidad, Astoria’s mayor and city council, and the city’s attorney and chief of police made edits, passing the document back and forth, until it was ready for a March 6, 2017 city council meeting. On March 6, around 25 La Voz de la Comunidad members went straight from a La Voz meeting to the city council’s meeting. Only two of them had ever been to a city council meeting before. Although a letter to the editor published in The Daily Astorian encouraged people to show up and oppose the resolution, no one did. Instead, Jorge read testimony he had prepared with La Voz, a Hispanic community member and member of La Voz spontaneously gave his own testimony, and the Astoria City Council unanimously passed the resolution. The resolution acknowledges the “vital contributions” made by Astorians from all nations and states “residents should be treated with compassion and respect regardless of national origin or citizenship status.” While, if required by federal law, Astoria’s city agencies and employees will still be expected to cooperate with federal agents, the resolution affirms that they won’t do so voluntarily. Most importantly, the resolution upholds American values of dignity and respect, freedom and opportunity for all people. A story with Healthy Beginnings+Healthy Communities Collaborative Racial Equity Agenda. Words are powerful. If you know how to be persuasive with language, you can get a lot done. However, your words can also work against you. If you don’t do the necessary preparation, your message could communicate something you never intended. Racial Equity Agenda, a Healthy Beginnings+Healthy Communities Collaborative, is busy doing that necessary preparation, creating an effective racial equity narrative for Oregon that will help community organizations begin important conversations about race with voters and policymakers, and move Oregon closer to racial equity. Amanda Manjarrez presenting at the Healthy Beginnings+Healthy Communities gathering of Community Collaboratives in Salem, Oregon. On February 7th, 2017, Amanda Manjarrez, Coalition of Communities of Color’s Advocacy Director, stood at the front of a small, windowless conference room in the Salem Convention Center and introduced the idea of a cohesive racial equity narrative to community members and organizers from across the state. She presented examples of how effective narratives and values-based language can be at triggering emotions. For instance, words like “illegal,” “violent criminal” and “radical” have been selected purposefully by politicians to invoke fear about specific races and religions. These words, part of carefully constructed narratives about undocumented immigrants, black men and Muslims, have been used, successfully, to advance policies and candidates. If community organizations in Oregon want to push back against these narratives and have positive conversations about race, we need to construct our own narrative that will spark other emotions that lead to more inclusive communities and shared prosperity. Unfortunately, people aren’t as logical as they like to think they are. In reality, humans make quick, emotional judgments, then use reasoning to justify those judgments. People also hold contradictory, competing ideas in their heads at the same time. It falls to communicators to choose the right story that will produce the desired emotions and lead an audience to take a specific action, whether that’s voting a certain way, donating to cause or something else. Amanda invited EUVALCREE Executive Director Gustavo Morales and Southern Oregon Education Service District’s Migrant Education Program Parent Involvement Specialist Monserrat Alegria to share their experiences having conversations about race. Both Gustavo and Monse live in rural Oregon communities (Ontario and Medford, respectively). They’ve been part of meetings where participants will get up and leave if “race” or “equity” are mentioned. They’ve seen their community members homes vandalized, families afraid to go home. According to Gustavo and Monse, the best way to start a conversation about racial equity where they live isn’t by talking about racial equity; it’s by opening with shared values like opportunity, children and families, and community building. These are narratives that almost everyone can connect with. Racial Equity Agenda’s goal is to find a narrative that will work for all Oregonians, a way to talk about racial equity that won’t cause people to shut down or leave the room, and will result in decision-making tables including more people of color. In order to accomplish this goal, Coalition of Communities of Color is partnering with several culturally-specific and mainstream organizations, including Native American Youth and Family Center, Latino Network, Unite Oregon, Urban League of Portland, KairosPDX, Causa Oregon, Asian Pacific American Network of Oregon, Hacienda CDC, Immigrant and Refugee Community Organization and Self Enhancement, Inc. By coordinating to use a unifying narrative for their work, their impact will be great. A story from Healthy Beginnings+Healthy Communities Collaborative Successful Transitions: Integrated Care for Children, Youth, and their Families. Yolanda Peña and Raquel Garay, two Latina mothers with children in Eagle Point School District in Southern Oregon, understand the barriers parents in their community face when trying to advocate for their children’s education. Such barriers include lack of understanding of the school system’s structure, language barriers, family responsibilities and disconnection from the community. Peña and Garay currently serve as the president and vice president of the Migrant Education Parent Advisory Council (PAC) in their district. Migrant Education Program of Southern Oregon is part of Successful Transitions, one of ten Collaborates that in Northwest Health Foundation's Healthy Beginnings+Healthy Communities Collaborative Cohort working to build power for kids and families. 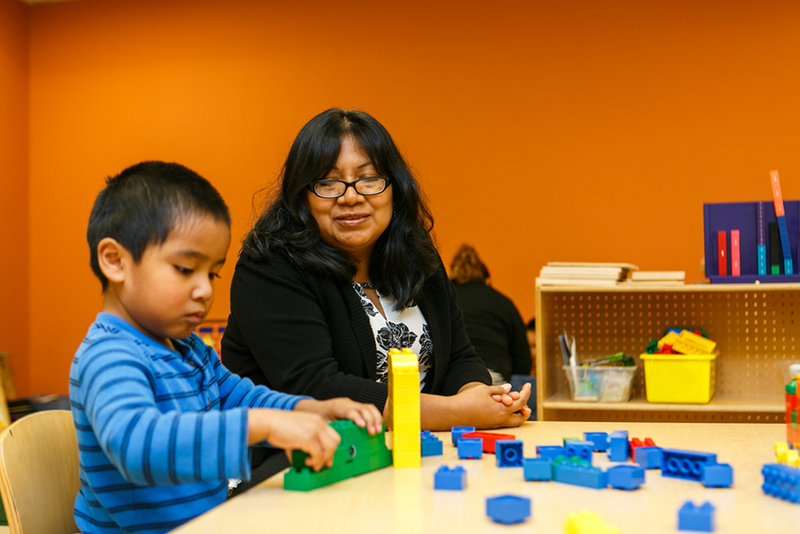 One of Successful Transitions’ goals is to empower Latino early learners, students and their families by providing parent leadership and advocacy opportunities. Through Successful Transitions, Garay and Peña had the opportunity to attend Northwest Health Foundation’s Healthy Beginnings+Healthy Communities gatherings in Astoria, Oregon and Vancouver, Washington in 2016. Participating in these leadership development activities encouraged them to take on various leadership roles in their community, but especially in their children’s school district. Learning about the issues other Collaboratives are dealing with has helped Peña realize that every community in our region experiences different barriers, and it’s crucial for Latino students and their families to share their personal experiences and to be represented in decision-making spaces. Garay and Peña know from personal experience that navigating the educational system can be intimidating for many parents. Being the president and vice president for their district’s PAC has allowed them to voice the concerns of many Latino and migrant parents, and to have a direct influence in the decisions made regarding their children’s education. Garay acknowledges that it can be intimidating for many parents to speak up and advocate for their children, but she urges them to advocate for their children and their community anyway. She motivates other parents to become involved in their children’s education by helping them see the impact it has in their children’s academic and social performance. By becoming active participants and working closely with the school districts, parents are not only advocating for their families, but for the community as a whole. Two stories from Healthy Beginnings+Healthy Communities Collaborative Eastern Oregon Latino Alliance for Children and Families, which is led by EUVALCREE. Ontario School District representative Benardina Navarrete and High School Student Genesis Romero stand on either side of an Ontario School District banner in the hallway of Alameda Elementary School. Genesis Romero is a EUVALCREE volunteer and a senior at Vale High School in Vale, OR. For her senior project she organized a resource fair to inform Latino families of existing resources and services in the community. The event took place on October 8th from 10am to 2pm at Alameda Elementary School in Ontario, OR. Later that evening, Genesis participated in a focus group hosted by EUVALCREE to discuss community needs with one of our major partners, Saint Alphonsus Medical Center - Ontario. She shared insights from her own experience, as well as her learnings from the event she organized. Genesis said: The best thing a student can have is the support of their teachers. Unfortunately, more often then not, students are not supported by their teachers and, furthermore, are frequently disregarded as someone who is not going to accomplish much in life. Genesis is graduating from high school this year. She dreams of becoming a forensic scientist and, later, a medical examiner. A EUVALCREE Community Organizer provides information on leadership and advocacy courses, and how to become a volunteer, at a table draped with a EUVALCREE banner. Three women and two kids crowd around the table. EUVALCREE recently conducted a different kind of community assessment. How was it different? They focused on reaching the community members that are hard to reach - the ones who have not accessed services or resources, or replied to a questionnaire asking what they could use to help them achieve their dreams for themselves and their families. The collection period occurred over the course of four months. 17 trained volunteers went door to door in Malheur County, Oregon, and Payette and Washington Counties, Idaho. The average household visit was approximately 60 minutes. With almost 900 volunteer hours in data collection, 497 community assessments were collected. The data was transcribed over the course of two months, and the results are currently being analyzed. From this information, EUVALCREE is developing a strategic plan to address the identified community needs and make the changes necessary to move the Eastern Oregon Latino community forward. Results will be made public once a strategic plan is adopted, and the strategic plan will be made public as well. Read more about EUVALCREE in The Ford Family Foundation's publication, Community Vitality. In Washington County, 27% of children 0-6 are Latino. Yet Latino children account for more than half of children in poverty. Here’s another shocking stat: Although 36% of youth and children in western Washington County are Latino, Hillsboro and Forest Grove school districts’ boards of directors are both 100% white. Furthermore, out of six Forest Grove city councilors and six Hillsboro city councilors, only one is Hispanic or Latino. This is unacceptable. This means that the Latino community, which is by far the largest ethnic/racial minority community in Oregon, is not represented at these important decision-making tables and does not have a hand in creating the policies that impact Latino kids and families. Enter Creciendo Juntos. Led by Vision Action Network and made up of collaborative partners from education and human services sectors, Creciendo Juntos engages Latino parents to become active in their kids’ education and involved in the community, with an end goal of breaking the cycle of childhood poverty. Latino parents who are currently active in this initiative live in high-poverty neighborhoods and attend areas within the six elementary schools with the greatest percentages of Latino children in the Forest Grove and Hillsboro School Districts; three in Forest Grove: Cornelius, Echo Shaw and Fern Hill; and three in Hillsboro: Lincoln Street, Reedville and W. L. Henry. In 2012-13, each of these elementary schools had an enrollment of 66-86% Hispanic students and a free and reduced lunch eligibility of 75-85%. Over the last couple years, Creciendo Juntos has strengthened Latino leadership through its Advocacy Team composed of one bilingual staff member and two Latino participants from each participating partner. Their meetings are focused on educating and empowering Latinos, and are all held in Spanish. Topics covered range from citizenship and immigration rights to navigating the school system and volunteering on boards and committees. With the newfound knowledge gained in these gatherings, parents become more comfortable participating at their kids’ schools and advocating for their kids’ education. Some of the parents involved in Creciendo Juntos are also eager to join parent advisory committees at the district level, and possibly even run for city council positions. Moving forward, the parents who started with Creciendo Juntos will become the teachers, helping new parents become familiar with school and community systems, sharing a vision of a thriving Western Washington county where Latino children and their families are healthy, successful in school, life and engaged in their community. Creciendo Juntos was one of Northwest Health Foundation's partners during our Healthy Beginnings+Healthy Communities Organizing Grant Year. Get out the Latinx Vote! A story from Healthy Beginnings+Healthy Communities Collaborative Healthy CAPACES. Acción Política PCUNista, PCUN's electoral organizing arm and a partner in the Healthy Beginnings+Healthy Communities Collaborative Healthy CAPACES, was formed in 1998 when a group of Pineros y Campesinos Unidos del Noreste (PCUN) members joined together to campaign for naming Woodburn's new high school after César Chávez. Although the school board voted against the name, they did agree to observe March 31st, César E. Chávez Day, throughout the school district. After seeing the impact their involvement had, the PCUN members decided to create Voz Hispana Causa Chavista, which was rebranded as Acción Política PCUNista in 2014. Since rebranding, APP has supported driver cards in Oregon and was instrumental in helping pass the 2015 Woodburn School Bond. As Oregon's only operating Latino 501(c)(4) organization, APP works to engage the Latinx community in the voting process. APP's work includes hosting candidate forums, Latinx voter education, voter ID and registration, canvassing, endorsing candidates, political mailing, phone banking and community organizing. This year APP endorsed and is supporting Teresa Alonso Leon's campaign for State Representative of House District 22. Teresa Alonso Leon was raised in Woodburn, so she's experienced the needs of the community. She comes from a working family and knows firsthand what it is like to confront and overcome barriers. Teresa is also the GED administrator for the state of Oregon and has served on the Woodburn City Council for four years. She's committed to improving the education system for children and adults, advocating for a more transparent government, and creating better paying jobs. If elected, Teresa will be the first Latinx and immigrant woman to represent one of Oregon's most diverse counties. Marion County is 25% Latino/Hispanic. Woodburn is 56% Latino/Hispanic. But this large Latinx community is not reflected on school boards, city councils or at the state level. By campaigning for Teresa, APP campaigns for an incredible leader who represents the Latinx community and acts as a role model for children with similar backgrounds and experiences. To support Teresa's campaign, APP hosted her canvas kickoff on July 2nd at PCUN. We spent hours on the phone inviting community members to this event. On the day of the event, we knocked on over 1,000 doors to spread the news about Teresa. Since the event, we've spent our time canvassing and talking to community members about their vision for Marion county. We've given presentations to diverse groups at college and high schools about the work APP is doing and Teresa's campaign. You'll also find us at most local events getting out the Latinx vote! Remember, voting is power and we should all have a say in the decisions that affect our communities. Let's stand up and unite for the people! If you are interested in participating or volunteering with APP, please contact appinfo@pcun.org.